When market trading in fruit and vegetables was in its prime. Although its still early morning we see the Flower sellers stalls to the right, already decked out with seasonal blooms and we note the loaded lorries at the rear of the family owned fruit and veg stalls recently arrived from across the Wholesale Market in Wulfruna Street close by. I could name many of these hard working stallholders most of them up before the crack of dawn to buy and lay-out their stalls in readiness for the days trading. 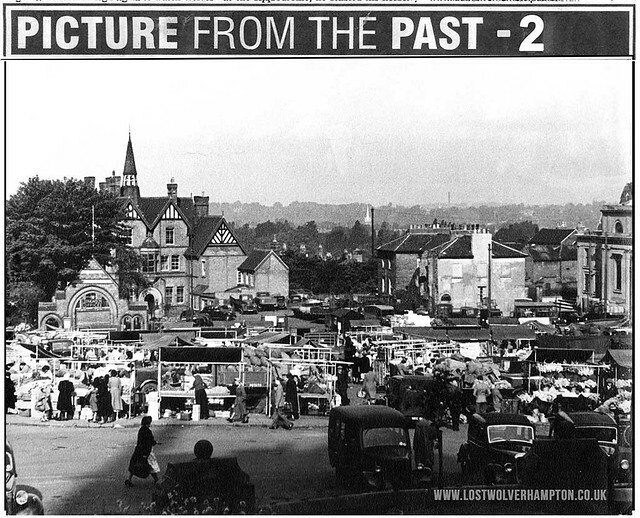 I can honestly say, I think myself most fortunate to have grown up close by here off North Street, and seen these markets indoor and here on the patch in their prime, on their original 20th century site, full of atmosphere and pageantry. Stalls past down through generations of the same families selling every variety of household needs., the likes of which we don’t see so much of today. and perhaps will see even less of in the future. But its that majestic 19th century building that dominates the background on this picture that I would like to bring to your attention. The earliest recollection I have was during the War when a large concrete water tank was built in its lovely gardens . Then later during my school days it also coupled as a school clinic, were cuts and bruises would be treated ,and teeth would be regularly checked and attended to . A painful experience as I recall. The building itself was the former home of the The Blue Coat School, the oldest and most substantial charity in Wolverhampton, it was established sometime between 1696 and 1700 for the poor of the town. Its small endowment was supplemented by legacies, subscriptions and donations from the well-to-do. It moved into these new, purpose-built premises in North St. in May 1881. The School’s first home was in Market Place (now Queen Square). The storytellers impression of the Market Place in 1750. 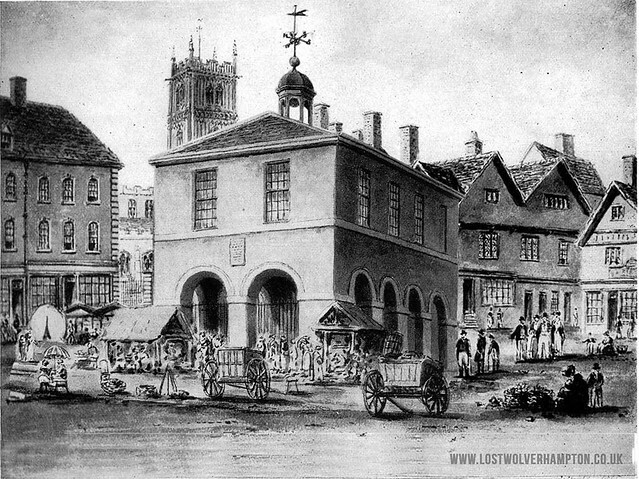 This Market Hall, situated in the Market Place (Queen Square) was an important feature in the town life of Wolverhampton. Probably built during the 16th century, and (like the one at Bridgnorth) constructed of “half-timber” supported on stone pillars, and so unlike that at Much Wenlock, which is built on wooden pillars, or others that are constructed entirely of stone. It measured from east to west 60ft. 6in., and from north to south 31ft. 6in., and so the room above was of a good size. Here justice was administered and any other public business transacted. The threatened buildings are mentioned in the Act, and the Market Hall was one of them. The upper part of this building (which is described as being a very ancient one) had been used for holding certain Courts by the Officers of the Lord of the Manor of the Deanery of Wolverhampton (a lessee of the Dean) and also as a Charity School (the Blue Coat School), which then was for 50 boys and 40 girls. This seems to have been the original schoolhouse of this foundation, the reason for which was probably due to its attachment to the Collegiate establishment, the owner of the building. It was run by twenty-four trustees, it provided boarding facilities and a “sound, practical and religious education” for poor children. In 1877, the School’s annual income, augmented by collections at St. Peter’s Church, was 400, and it was able to clothe about eighty children and board twenty in that year. For a time in the mid-Victorian period, the School’s Honorary Secretary was Charles Mander, varnish manufacturer, and later In the twentieth century, the School became a day and boarding school for girls only. The Blue Coat School closed around 1923, but its endowment continued to support Anglican schools in the town. The North St. premises subsequently housed the Wolverhampton Borough Education Offices until around 1970, when they were demolished to make way for redevelopment. which included the extensions to the Telephone Exchange. 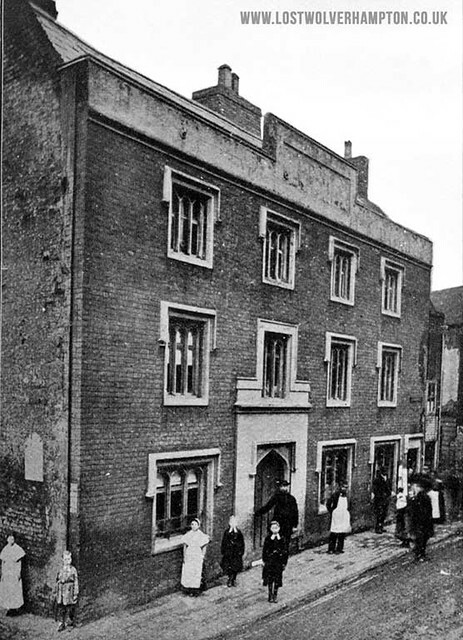 The Education Offices by then had moved to St. John’s Square. In the description in 1st paragraph, under the title ‘The historic backdrop’, it states that St Peter and St Paul’s chapel is on left of the picture, when in fact from our perspective it is in fact on the far right. The building just to its left, with 3 windows which are bricked up, I remember buying sweets from the 1st premises, as it used to be a small corner shop, I remember when it and the adjoining premises were knocked down using a crane with a ball and chain. I used to attend the school that adjoined the parish church of St Peter and St Paul’s. I was 10 years old at the time when the school ceased to use these premises but moved to a school from the opposite corner of Molineux stadium. Well spotted – I would like to say it was a deliberate mistake to test peoples knowledge But no it was just an error transferring from mind to paper. I don’t recall the corner shop, you mention. But I certainly recall Red Cross Street old school, were you were transferred too. I don’t remember the name of the street, it probably doesn’t exist now, as I can’t see it on googlemaps, must have been taken over by the accommodation for the university students. The ring road was the start to the clearing down of most of the central area of Wolverhampton, although as a 10 year old, I didn’t know that much of the town. I remember the ring road being built, WELL health & safety (????) back in those days didn’t exist, the road works were fully accessible to everyone, especially the area between Bath St and the brewery.